For more inspiration be sure to visit my new blog! 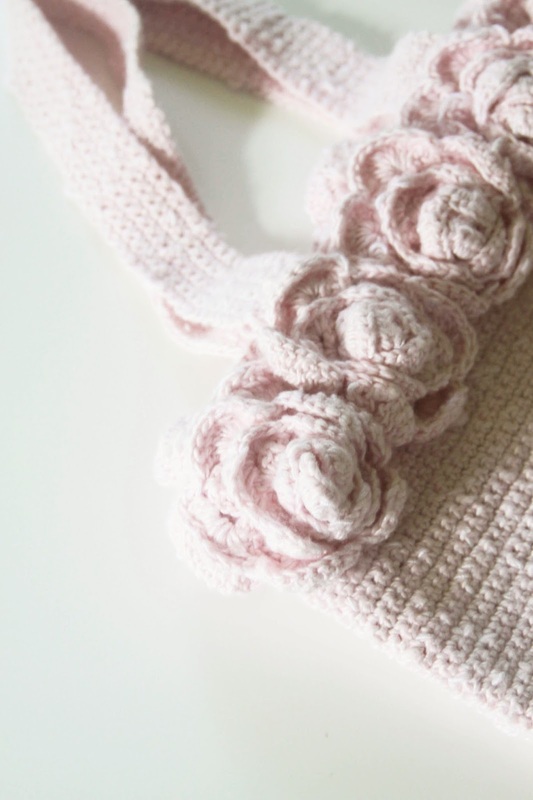 Back when I first started crocheting flowers, I searched around for a pattern for a crocheted rose because roses were such a big inspiration for me. I'm a bit rose obsessed if truth be told. And inevitably in my fabric designs, too. 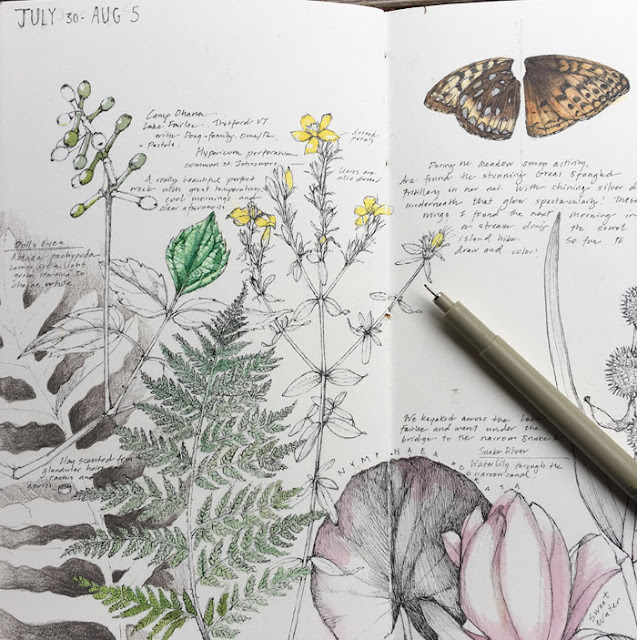 Brightly colored roses showed up in my Summer Bliss collection and these dramatic blue roses made their way into the collection called My Garden Sketchbook. 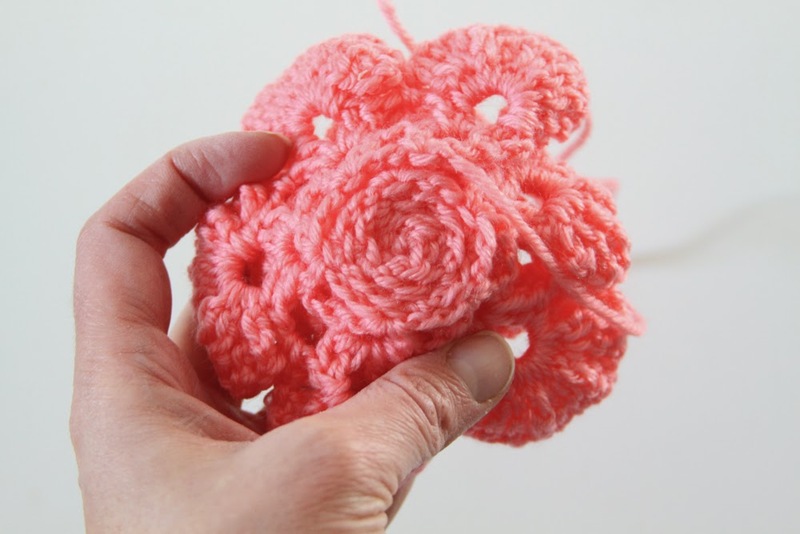 There are a lot of crochet patterns out there and it was hard to find just what I was looking for, a realistic-looking, three dimensional crocheted rose. Eventually I found one that I liked, but it still wasn't just what I had in mind. I wanted to go further and have a more realistic look for my roses, so I modified the pattern. Once I started making them I wanted to put them on everything. 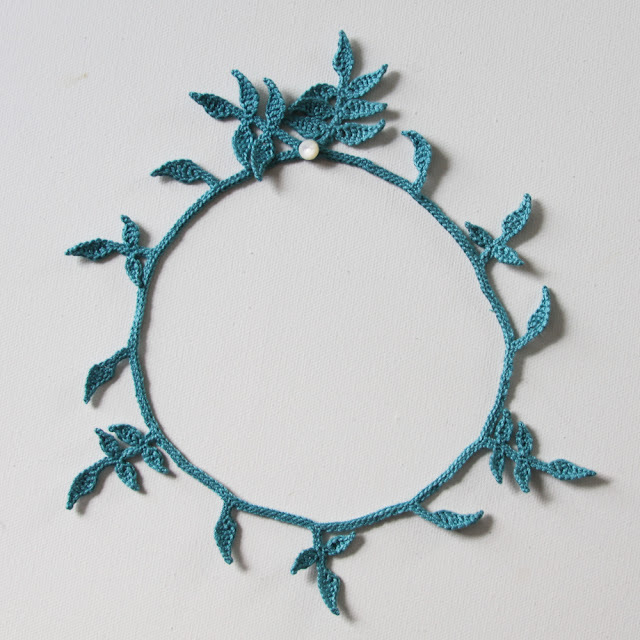 I used fine crochet thread and added them to jewelry. I used thicker yarn and made dramatic brooches and sewed them onto bags and purses. I even made some out of wool yarn and felted them. 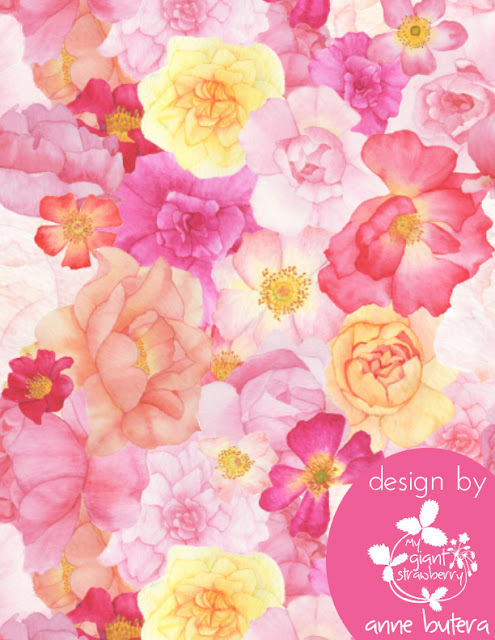 What's fun about my pattern is that you can modify it and make many different kinds of roses. 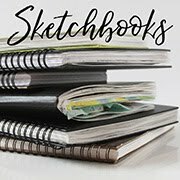 I've tried lots of variations and I'm going to share the basic pattern with you today and some thoughts on how to modify it further if you want to experiment. Because I originally found the pattern online for free I want to return the favor and share my modified pattern for free, too. 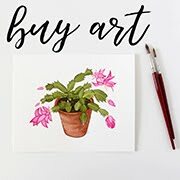 Because of the popularity of the pattern and repeated requests for a printable version, it's now available for at a modest cost in my original Etsy shop. I hope you will enjoy it as much as I have. 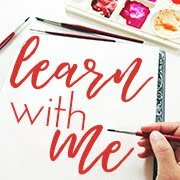 If you don't crochet, now is the perfect time to learn. 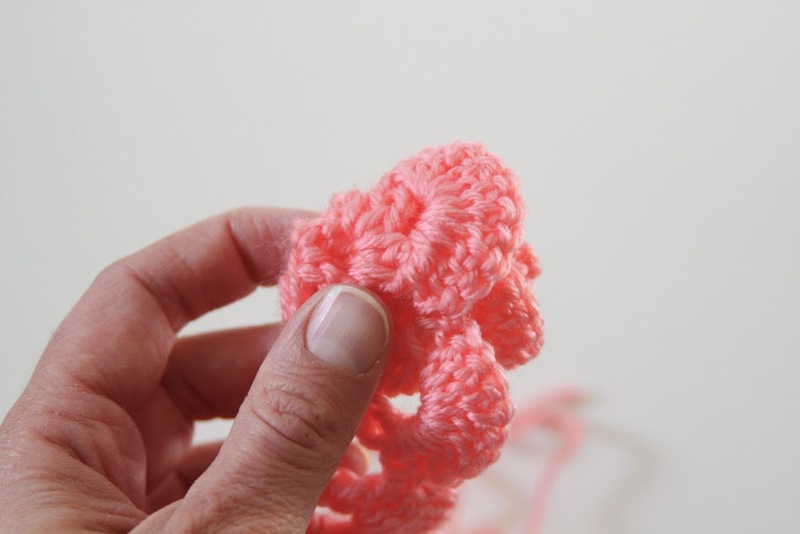 In order to make this pattern as easy as possible for beginning crocheters, I've included step-by step photographs as well as written instructions. 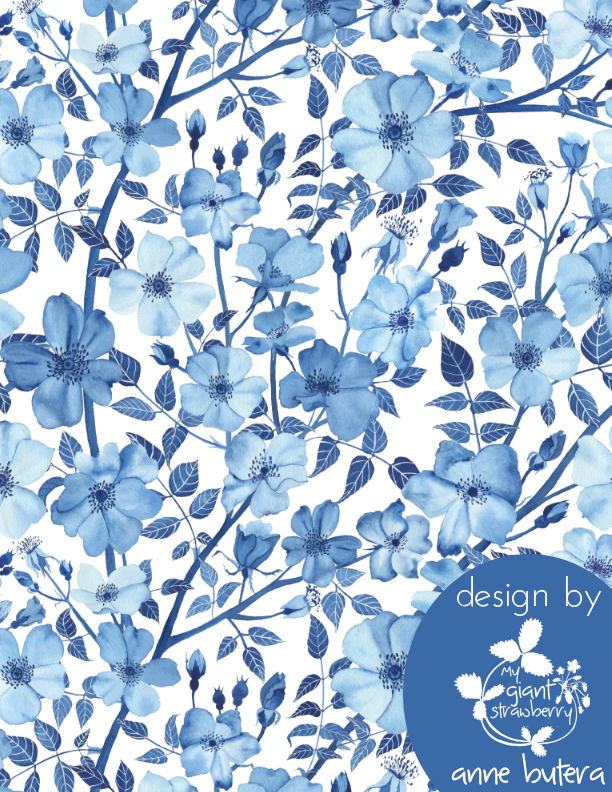 (The other patterns available in my shop are very similar to this. The main difference is that I use abbreviations in the written instructions for the sake of brevity). 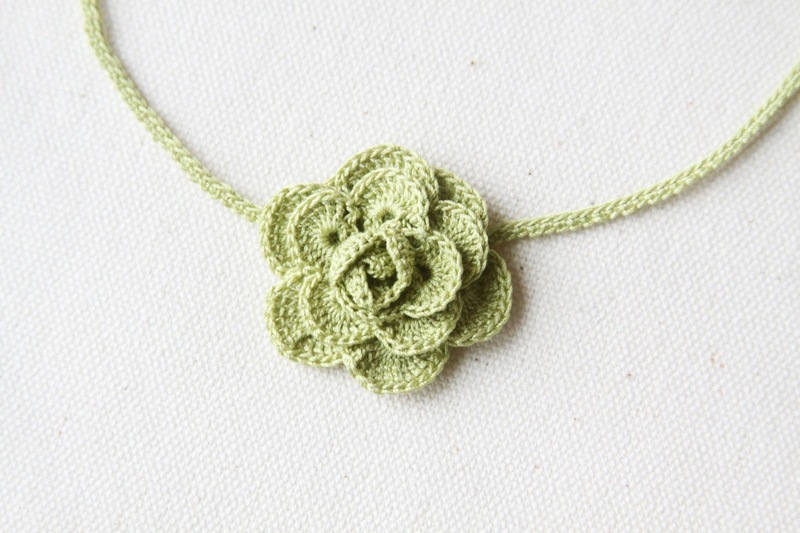 The pattern for my vine and leaf necklace, whether created as written or adapted, makes a beautiful base for a crocheted rose necklace. I love that the possibilities are nearly limitless! 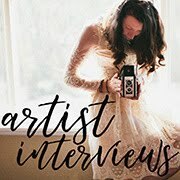 If you have any questions or need clarification at all, please let me know in the comments or feel free to email me (although this post was originally published in 2014, I'm still maintaining this blog and continue to respond to comments). I'm always delighted to hear from my readers and ready to help! to make the roses for my necklaces. They come in so many different colors and are readily available at just about any craft store. For this example, though, I'm using a mini skein of worsted weight yarn and a size G hook (4.25 mm) because it's much easier to see the stitches. Foundation Row: Chain 55 (leave a long tail). Row 1: Double crochet into 4th chain from hook. This makes your first V stitch. Chain 1. Skip 2 stitches. Double crochet into next stitch. Chain 2. 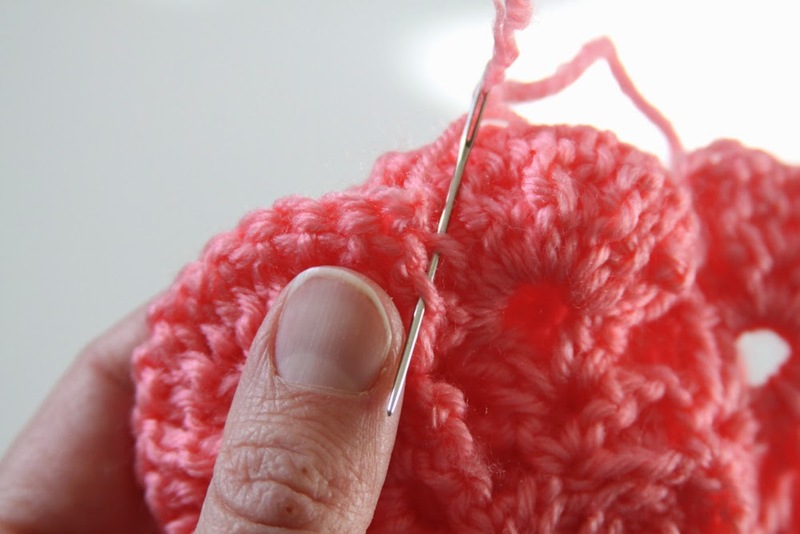 Double crochet into same stitch. Now you have 2 V stitches. Chain 1. Skip 2 stitches. Continue making V stitches (Double crochet. Chain 2. 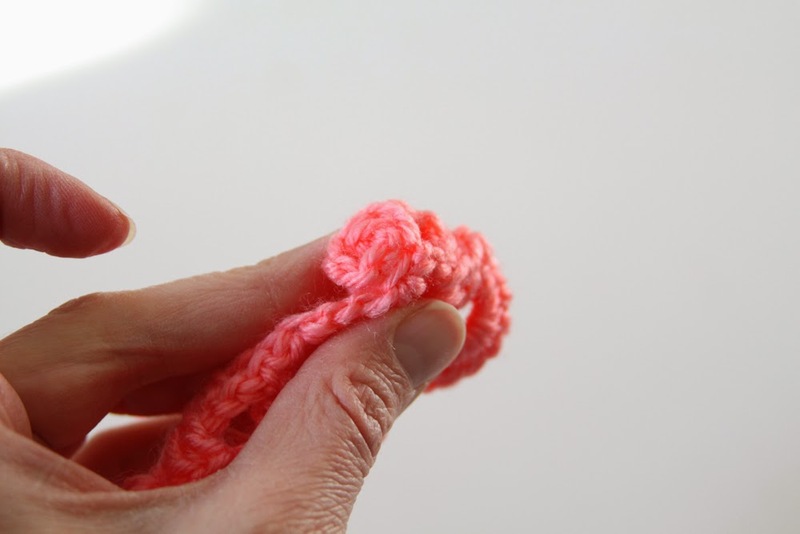 Double crochet into same stitch), separating each with a single chain stitch and 2 skipped stitches, across to the end of your foundation chain. You will have 18 V stitches. Row 2: Chain 3 (counts as 1 double crochet). 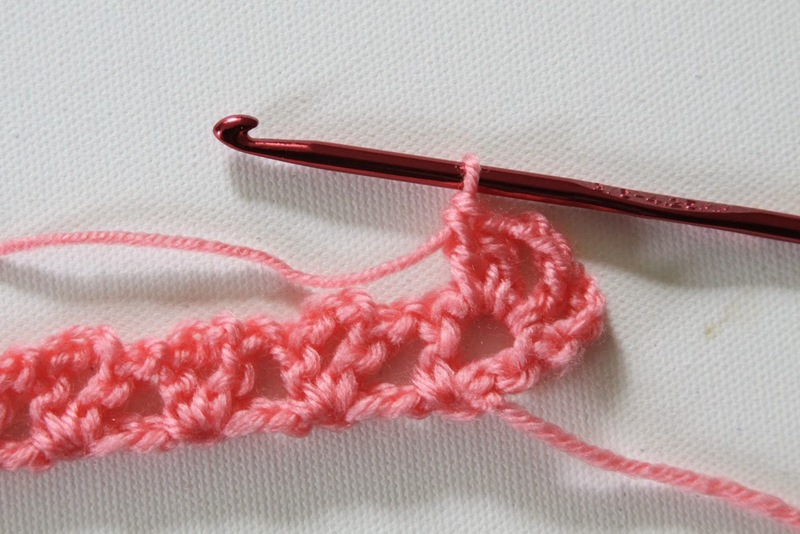 Work one double crochet into the first V stitch space of Row 1. Chain 2. 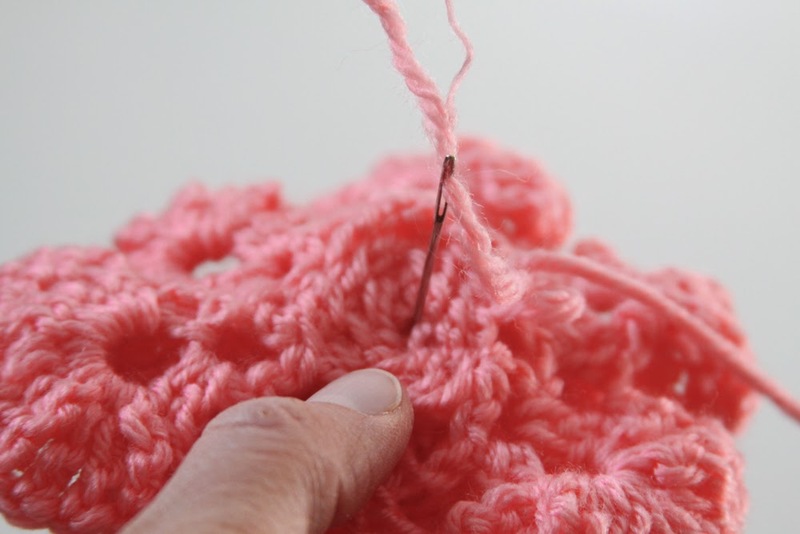 Work 2 double crochet into the same V stitch space. This is your first large V stitch. Chain 2. 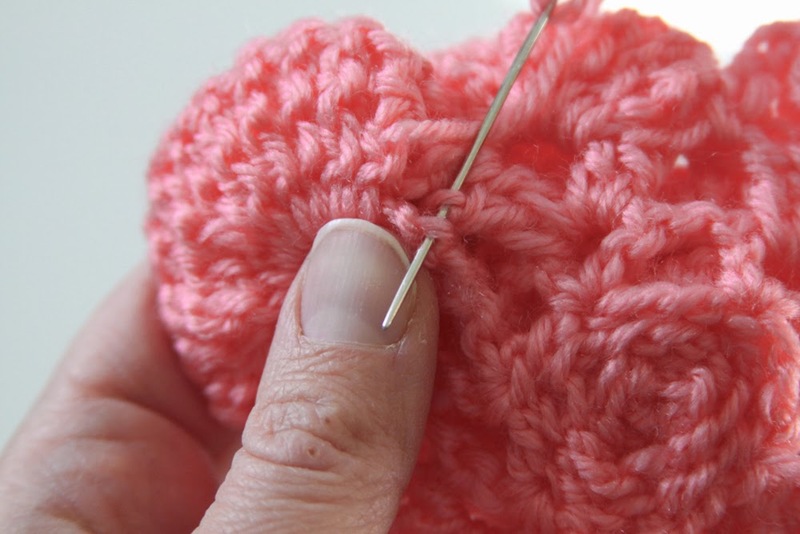 Make another large V stitch (2 double crochet. Chain 2. 2 double crochet) in the next V stitch space. Chain 2. Continue making large V stitches in each of your Row 1 V stitches, separating each with 2 chain stitches. You will have 18 large V stitches. 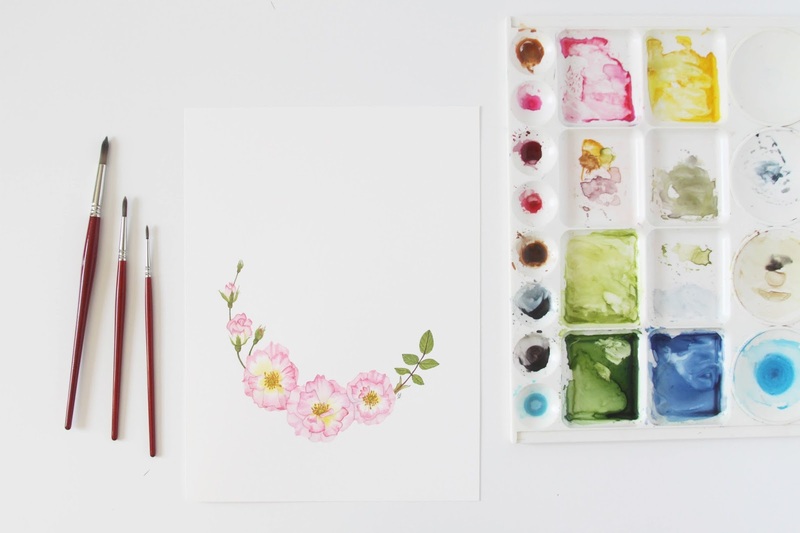 What you've created so far is the base for your petals. 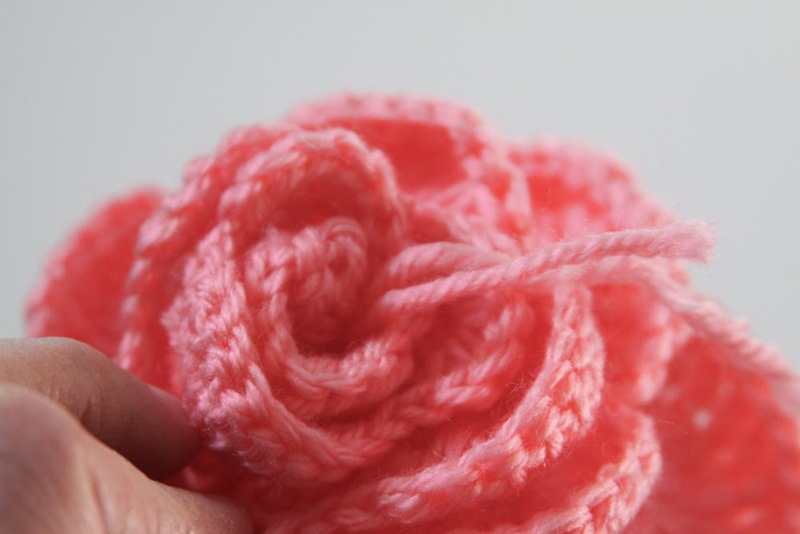 Each of the V stitches forms the base of a single petal (so you will have 18 petals in this rose). In the original pattern all of the petals are made up of the same size stitches. In my adaptation the petals vary in size, both in the number of stitches that make up each petal and the height of those stitches. 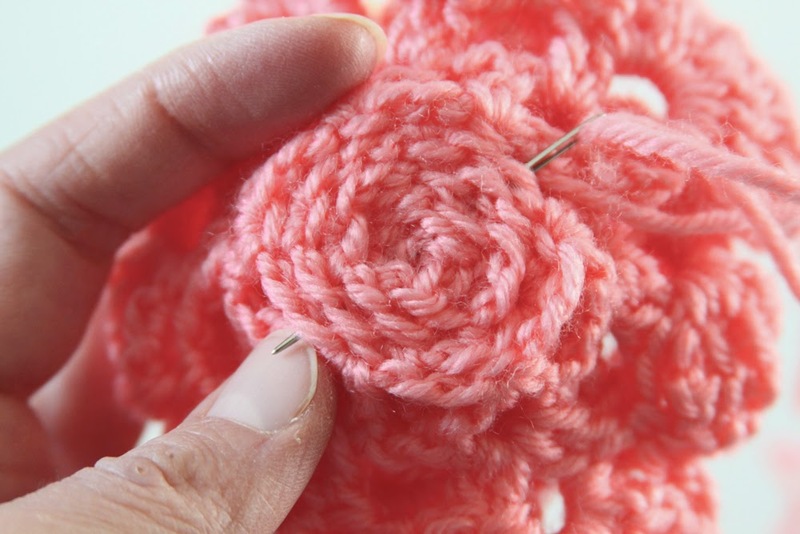 I start with the smallest petals as the center of the rose and then crochet progressively larger petals so that the outside petals are the largest. Let's continue and finish up this rose. Row 3 (the petals): Chain 2 (counts as first half double crochet). Half double crochet 6 times into first large V stitch space. Single crochet in the 2 chain space between the first two large V stitches. 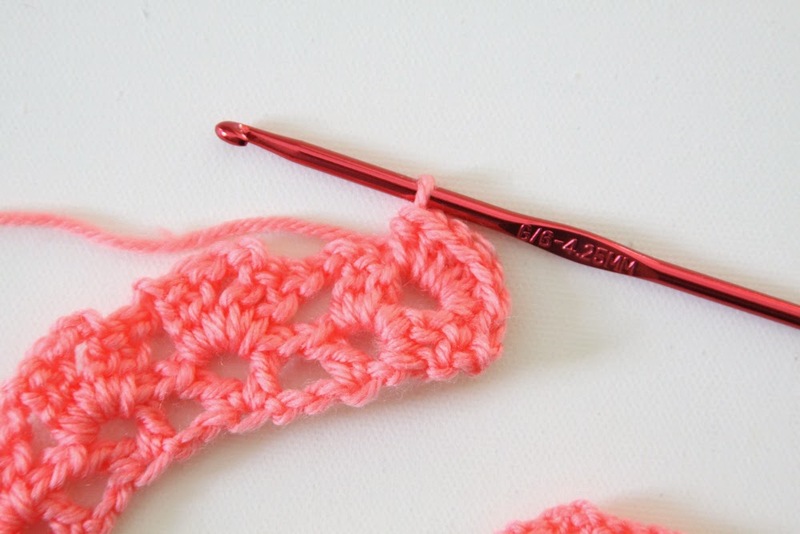 Make 7 half double crochet stitches in next V stitch space. 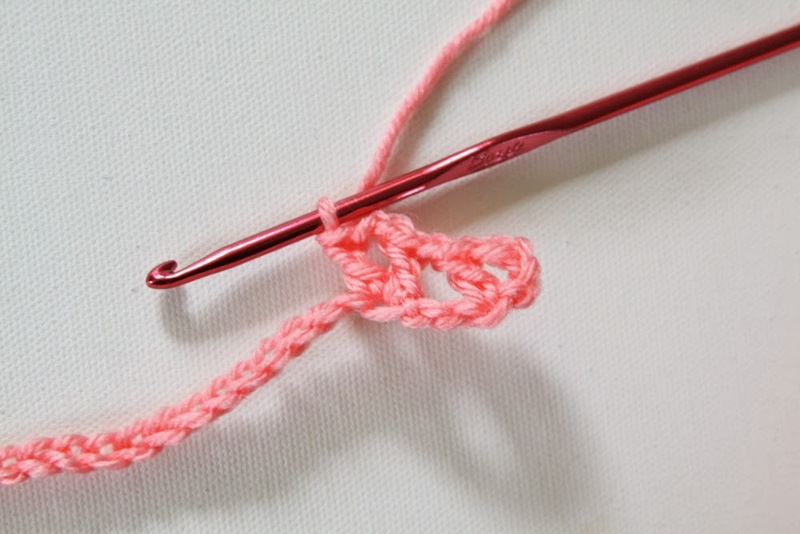 Single crochet in next 2 chain space. 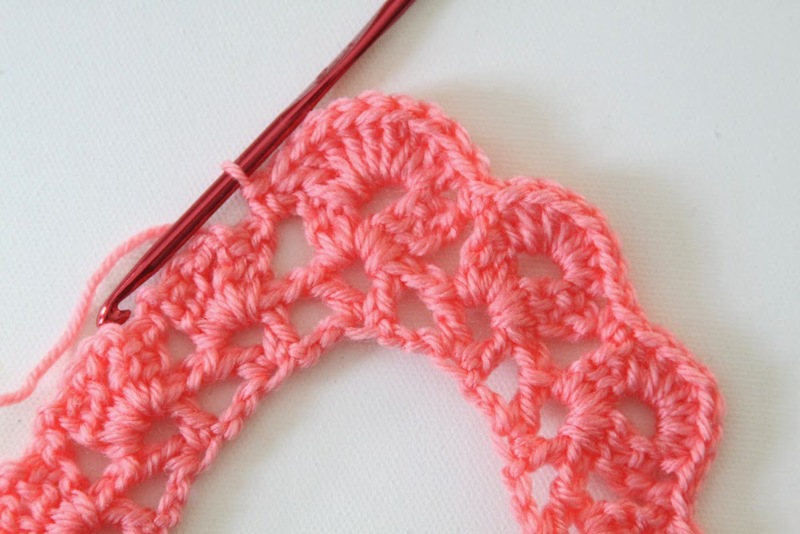 Make 7 half double crochet stitches in next large V stitch space. This gives you a total of 3 small petals. Single crochet in next 2 chain space. Now we'll move on to the next size petal. 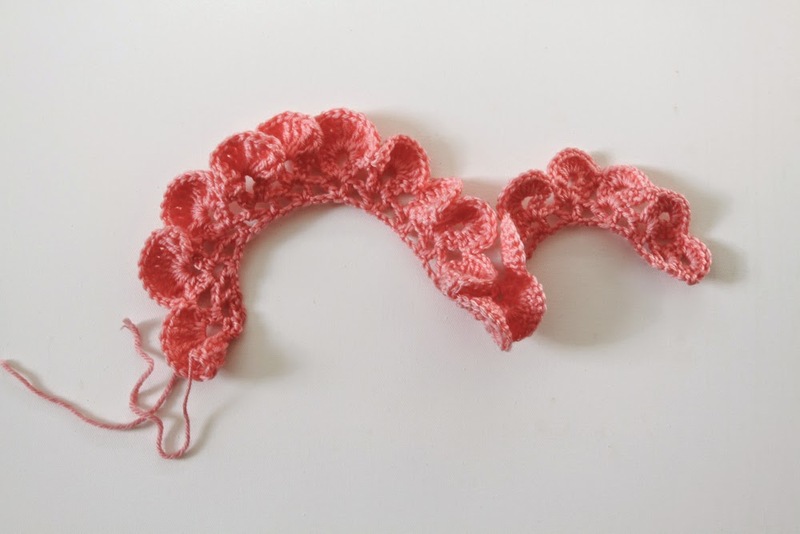 Make 9 double crochet stitches in next large V stitch space. 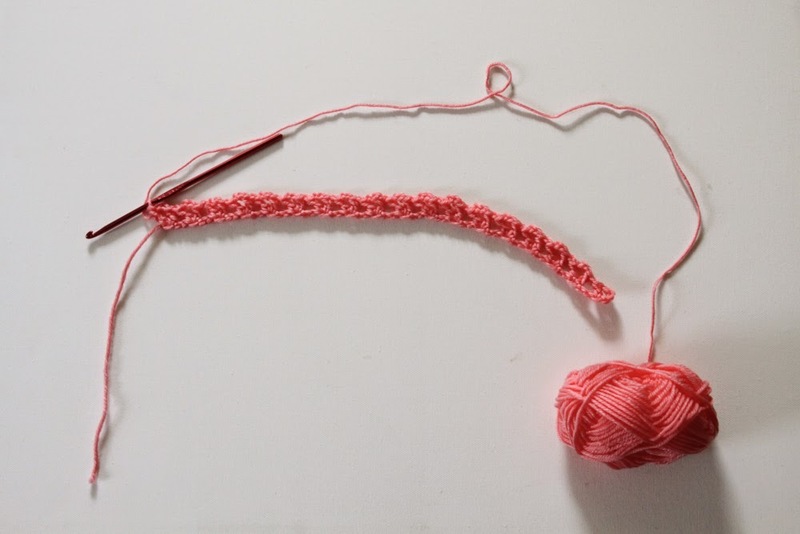 Single crochet in next 2 chain space. 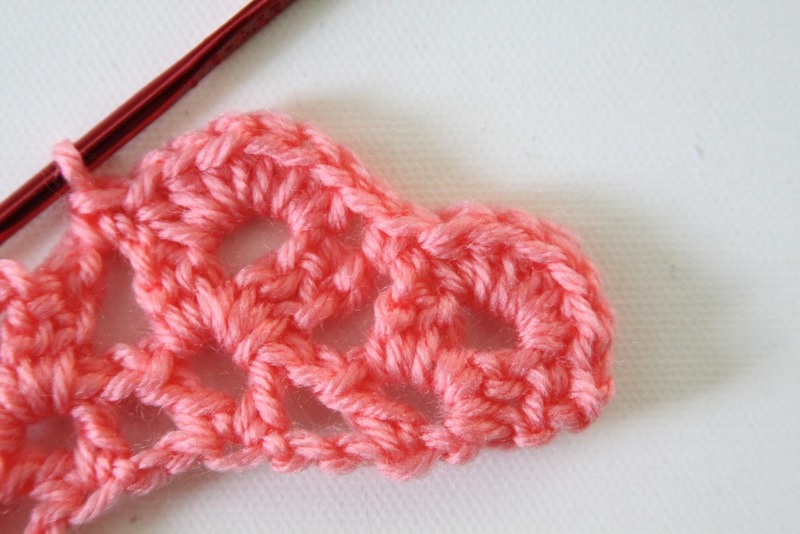 Make 3 more petals with 9 double crochet stitches in the next 3 large V stitch spaces, separating them with single crochet stitches made in the 2 chain spaces between the large V stitches of row 2. 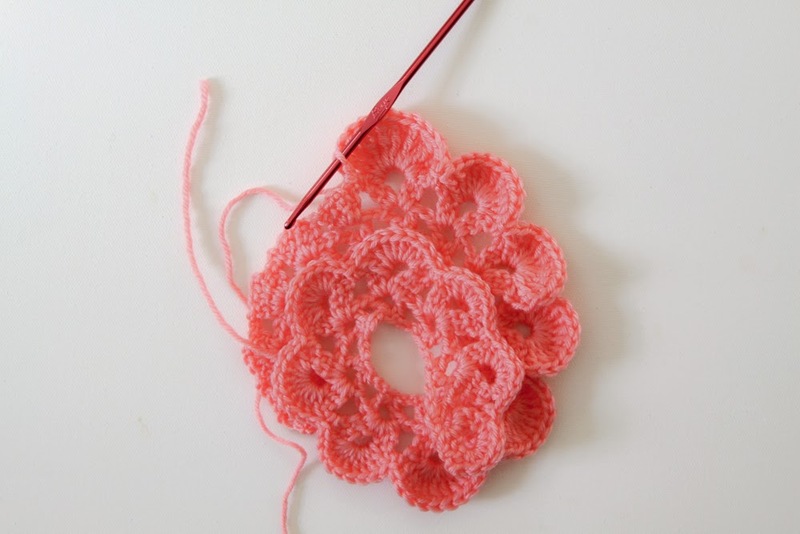 For the next size petal, make 11 triple crochet stitches in next large V stitch space. 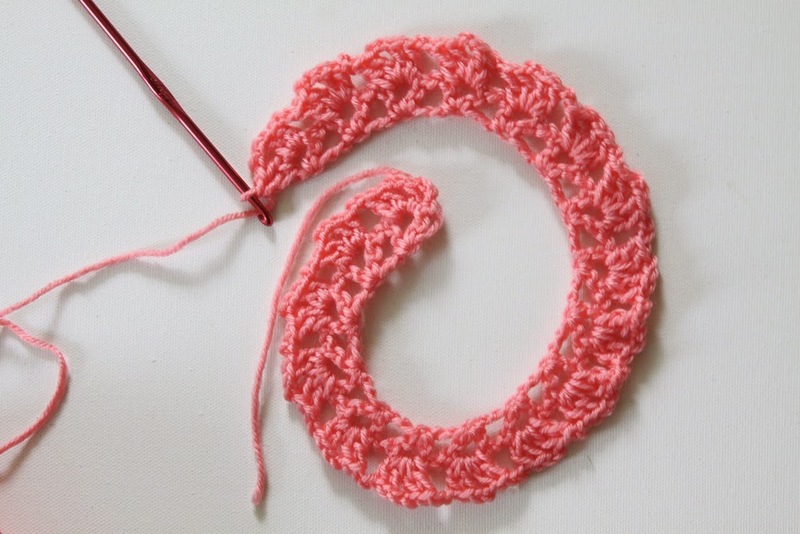 Single crochet in the next 2 chain space. 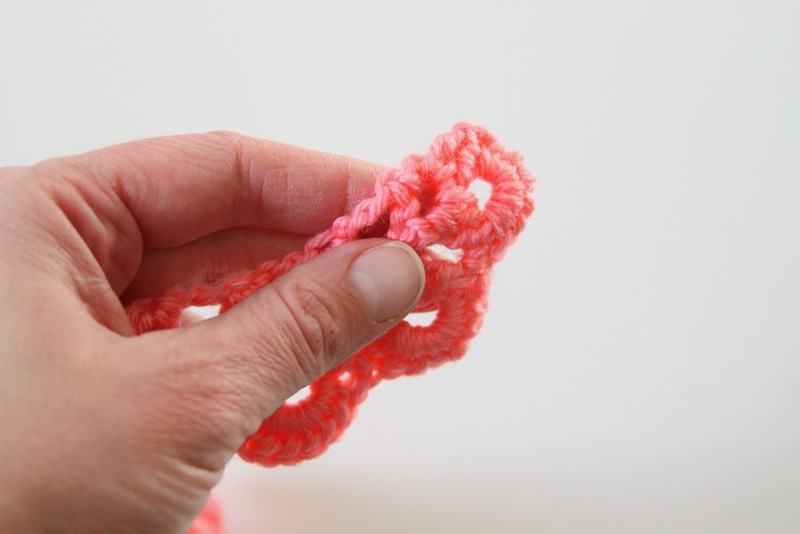 Create 4 more petals with 11 triple crochet stitches, remembering to separate the petals with single crochet stitches in the 2 chain spaces between the large V stitches. For the next size of petal you will crochet 13 double triple stitches in the next large V stitch space. 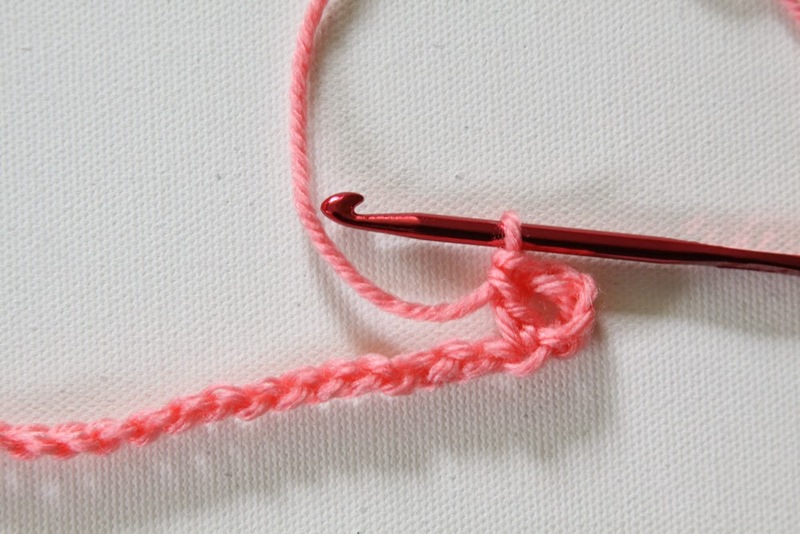 Single crochet in next 2 chain space. You can see that the fabric is already wanting to spiral into a rose shape and that the larger petals are beginning to curve. With these large petals it will be a bit of a squeeze to get all of the stitches to fit in the V stitch space; that's what creates the curved shape of the petal. 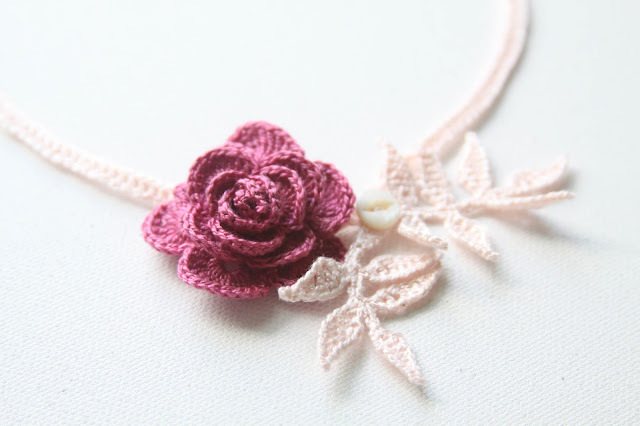 To finish your rose create 5 more petals with 13 double triple stitches, again, remembering to separate the petals with single crochet stitches in the 2 chain spaces between the large V stitches. Fasten off, leaving a long tail (6-8 inches should be enough. Mine is a bit shorter because I came to the end of my skein). To finish your rose you will roll it into a rosette shape. Take the end with the smallest petals and begin rolling from the center out. Be sure you are rolling in the direction that the larger petals are curving (counter clockwise). 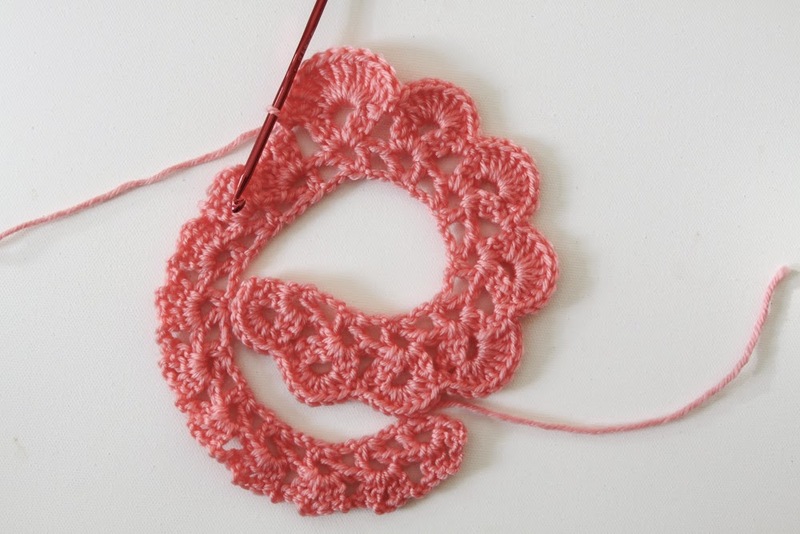 Line up the original chain stitches from your foundation row to create the base of the flower. until you have wrapped the largest petals around the rose, making sure to keep the base of the flower flat. Leave the tail from the last largest petal loose for now. Thread an appropriately sized needle with the beginning tail. 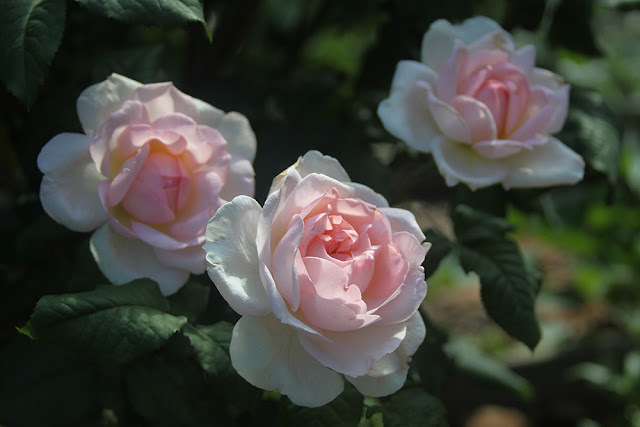 You will want to check the front to make sure that your petals are arranged nicely. Adjust them if necessary. 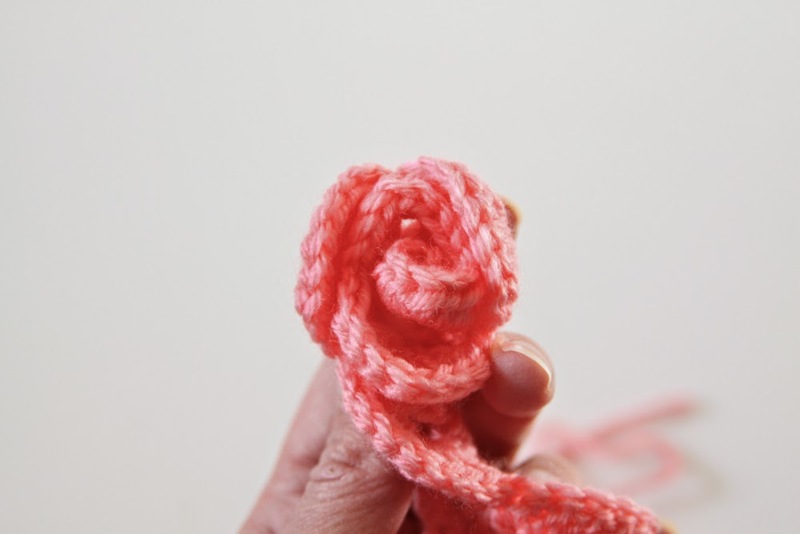 Now you will secure the rose by working the tail back and forth through the base of the flower. Continue until you have only a couple inches of tail left. Turn your rose over and look at the last large petal to see where you want to secure it to the flower. For mine I want to secure it to the middle of the petal above. 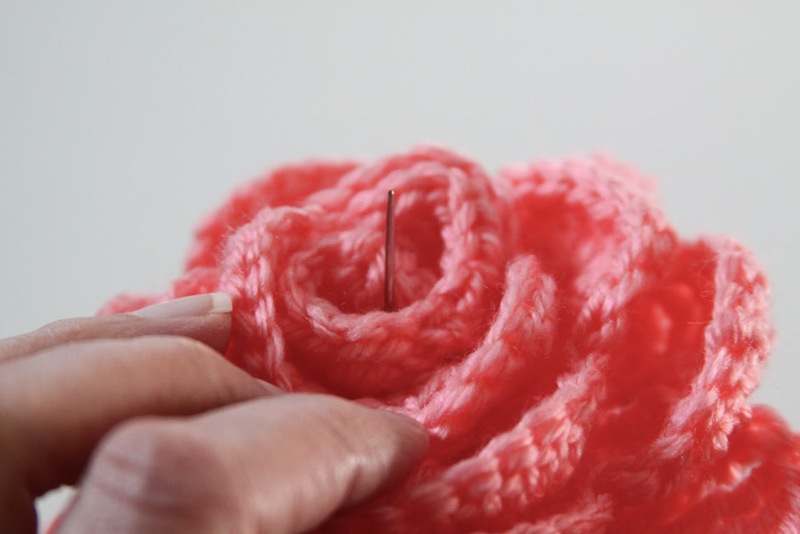 working your stitches down to the base of the rose. and through the center of the spiraled petals in the front of the flower. Work the rest of the other tail end up through the center as well. 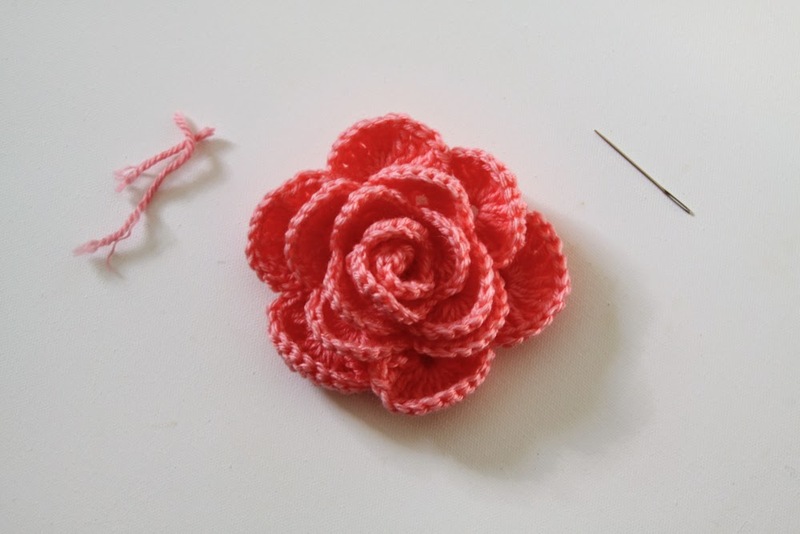 Alternatively, you can work with longer tails and leave them loose on the back of the flower so you can attach the rose to another piece (a purse or a hat or necklace or scarf...) or to a pin back to create a brooch. 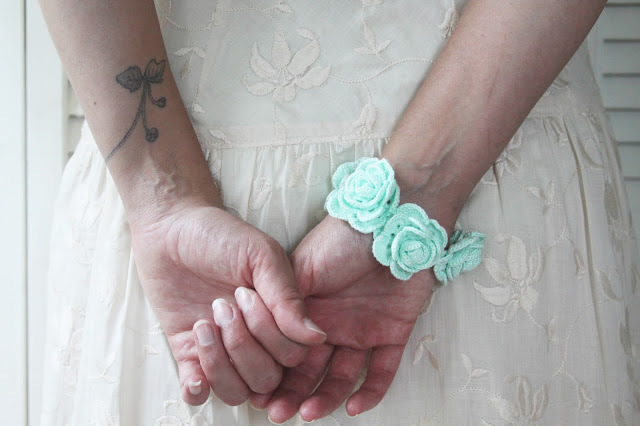 Sew multiple roses together into a lovely bracelet. 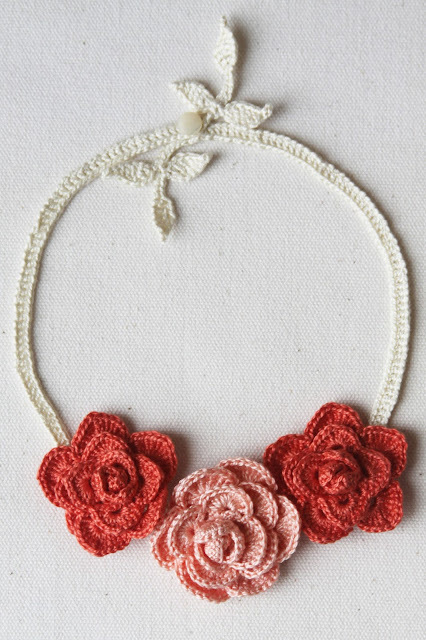 Or add one to a simple crochet chain for an easy necklace. The pattern is also so easy to adapt. You can increase or decrease the number of petals by changing the length of the foundation chain. Just be sure your chain is a multiple of 3 plus another 4 stitches. You can also adjust the size and number of each size petal. For this rose there were 3 petals made of 7 half double crochet stitches, 4 petals of 9 double crochet stitches, 5 petals of 11 triple crochet stitches and 6 petals of 13 double triple crochet stitches. Playing around with the number of stitches and their heights will give you different looks for your flower, so experiment with changing these numbers. 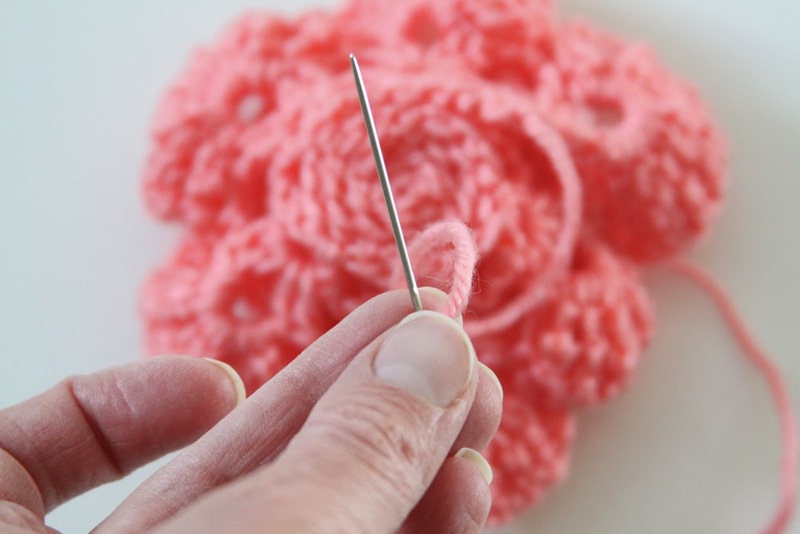 by varying the heights of the stitches within each petal (for example for the small petals you may want to make a petal with 2 half double crochet stitches, 3 double crochet stitches and another 2 half double crochet stitches). 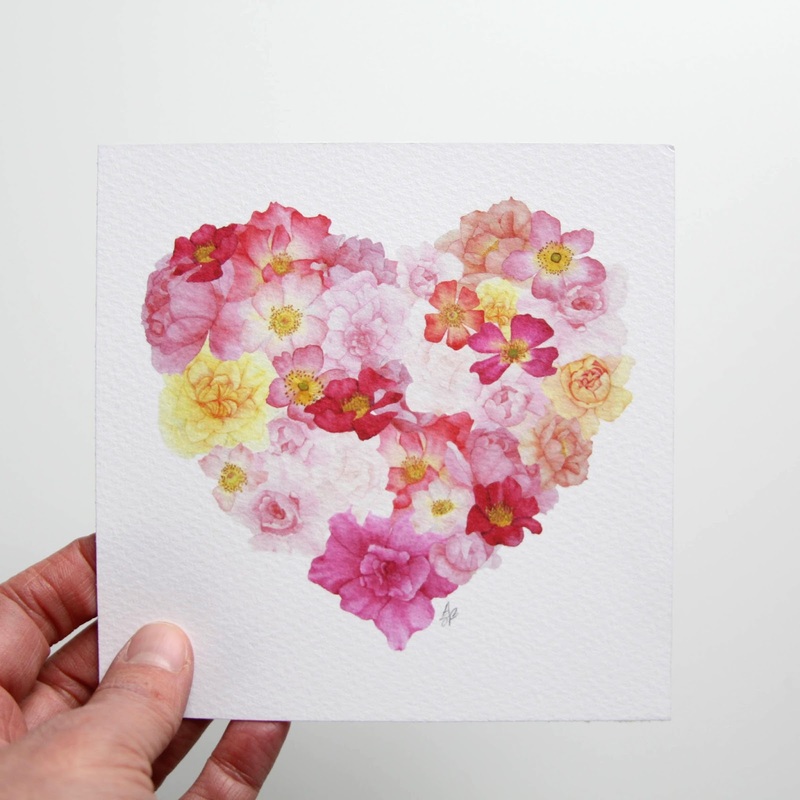 Experiment and see what different petal shapes and sizes you can create. Whatever you make, I'd love to see it! 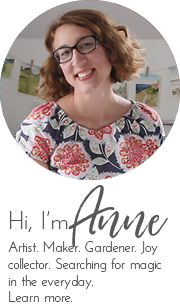 And please sign up for my JoyLetter for joy, inspiration and occasional special offers delivered right to your inbox. 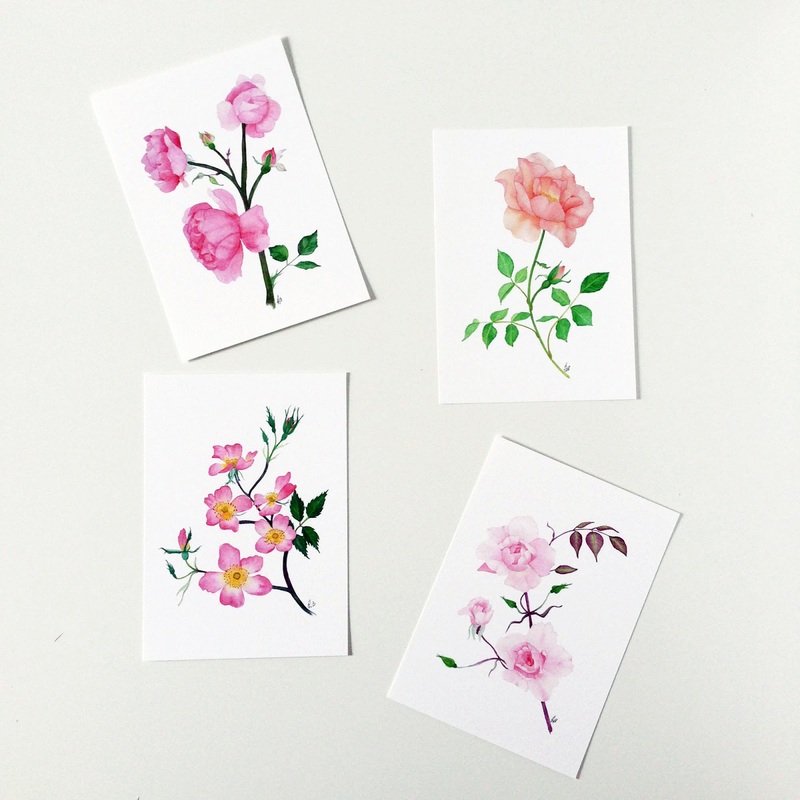 You receive a free (rosy) gift just for subscribing! Such a cheery post on a grey day here in Vermont! I think I was overcompensating for the dreariness by choosing such a bright yarn. It was really hard to photograph. Hope you're on to some brighter days now! Your rose is so beautiful and detailed! Thank you for sharing the pattern and step-by-step instructions with us. Like Hedgerow Rose, I need to learn to crochet first before attempting a rose but your pattern is great incentive :) Happy New Year to you and your family! Thanks, Sharon! I'm sure you'd be able to easily learn. 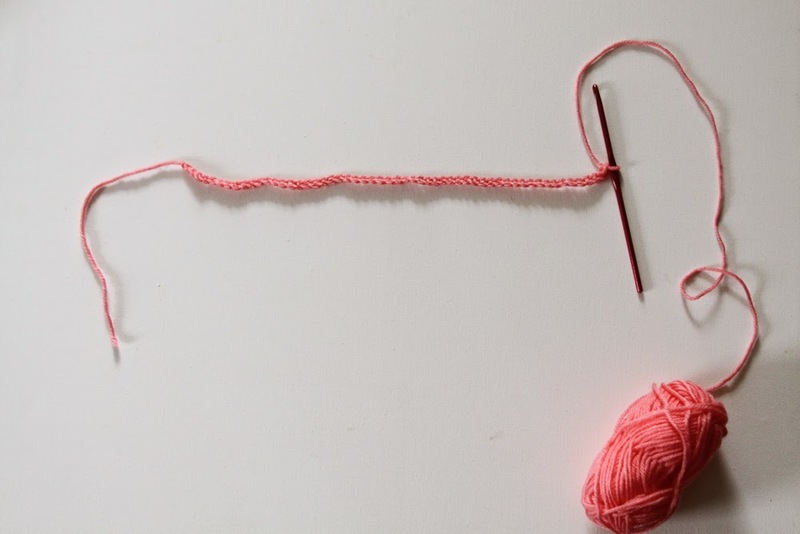 And then think of all the crocheted bits you could make for your fun stuffed dolls! Thanks, Wendy! So glad you had success with my pattern! Pretty, pretty. Am I able to pin this for later? 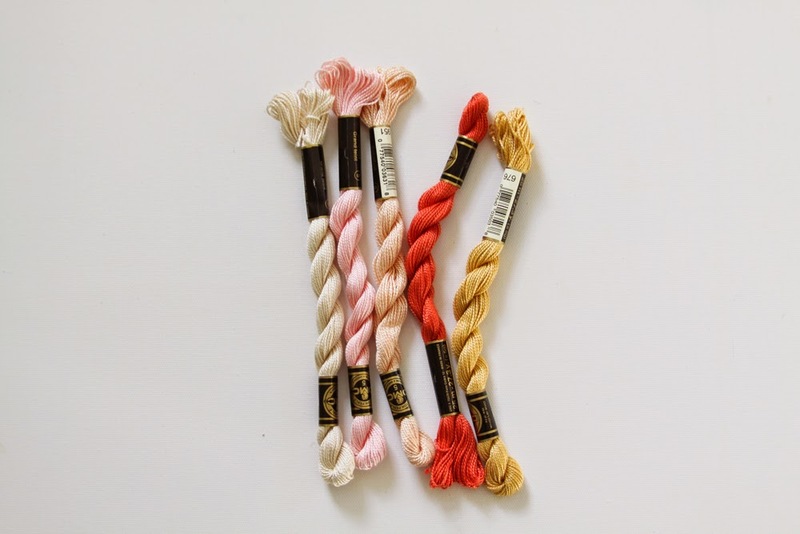 Will the Bon Bon yarn by Lion Brand be enough yarn for one rose? I'm not 100% sure as I don't have experience with that yarn. I used a mini skein that had about 50 yards and was able to make a rose from that. 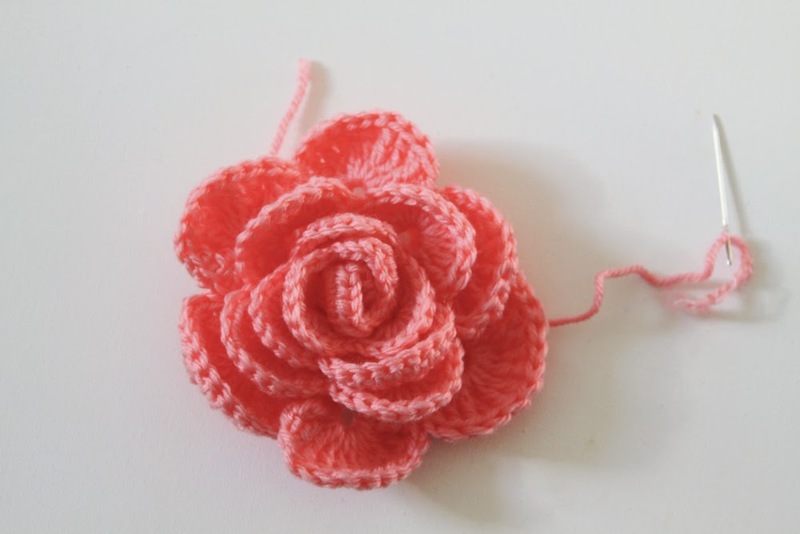 If you're unsure you might want to try making a slightly smaller rose. Start with a chain of 46 which would reduce the number of petals to 15. Have fun and experiment! Anne , I have a question , I finished the 7 hdc shell now am I suppose to within the same row continue 9dc petal,11tcs petal,13dts petal? And not with starting a new rows? I have this makes scene. Hi, Judy, yes, you do make all of the different sized petals (shells) in one row. The whole rose is just one long strip that gets rolled up to make the flower. I hope this helps. Thanks for stopping by and happy crocheting! This pattern was amazing! It was easy to follow and my flower turned out beautifully! I cannot wait to make more in different colors and yarn weights! Thanks again. 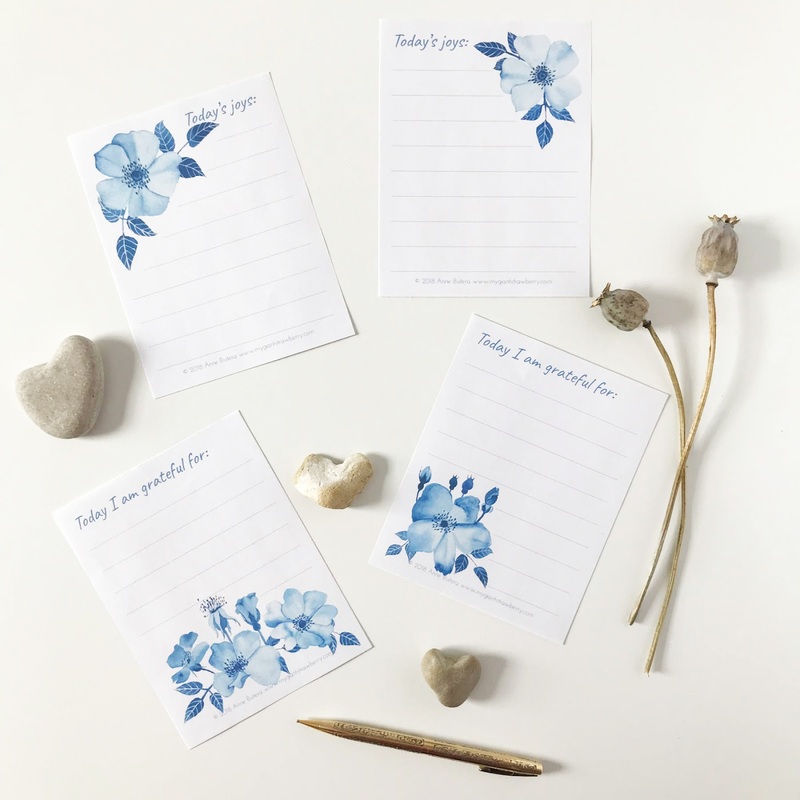 Do you have a printable pattern? Can you tell me how big this flower is when completed? Hi, Sandra, I don't have a separate, formatted to print version of this pattern. There are a few ways you could go about printing it. Copying and pasting it into something like Word would work and allow you to choose which of the photos and text you need. Using the print dialog in your browser (depending on which browser you're using) can give you control of things like which pages, or specific selections of the page you can print. 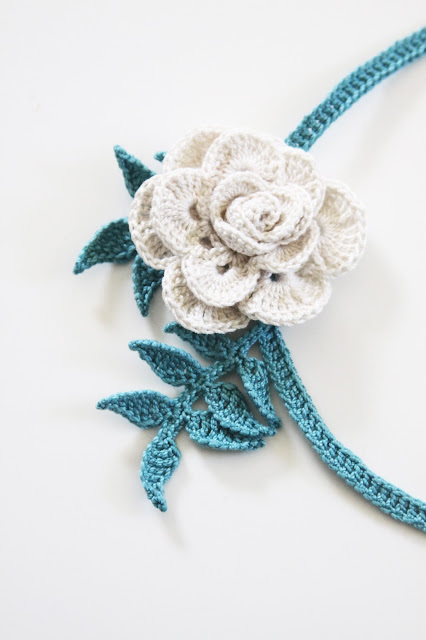 The size of the completed rose will vary by material and size of hook you use as well as what tension you're crocheting with. 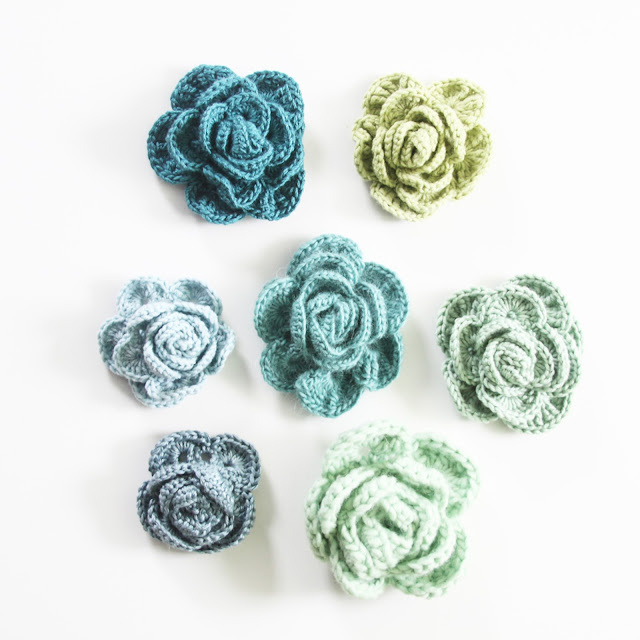 Little perle cotton roses made with a tiny hook could be as small as an inch across. 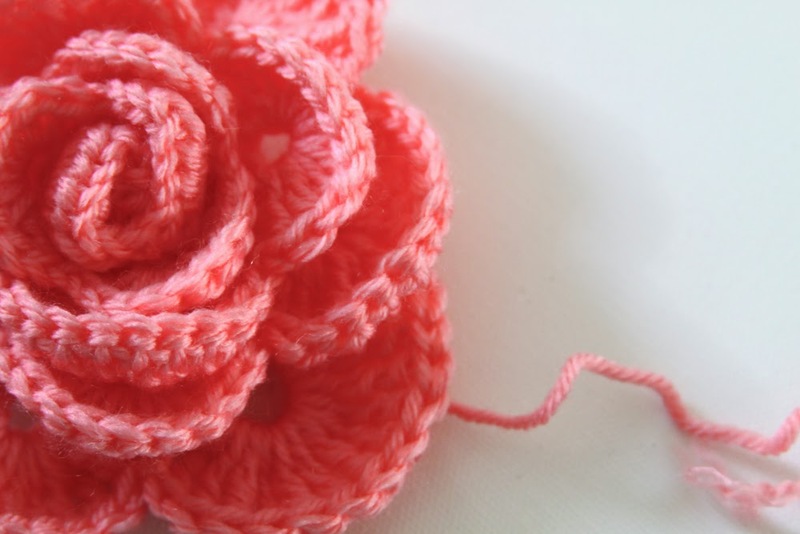 Worsted weight yarn crocheted with a size G hook would give you a rose that's maybe 4 inches across. 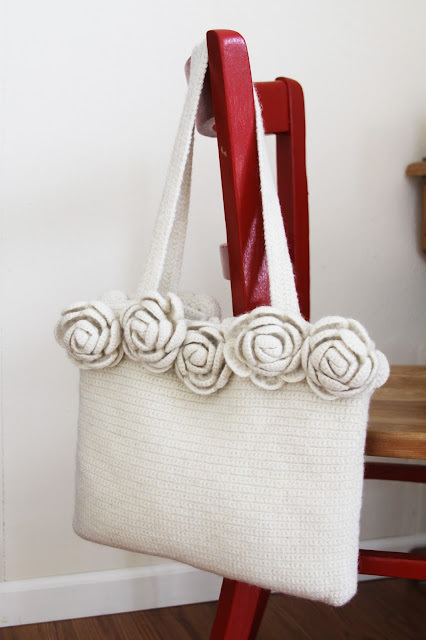 I've used bulky yarn and a large hook to create roses that are as big as 10 inches across. It's really up to you how big your rose will be. 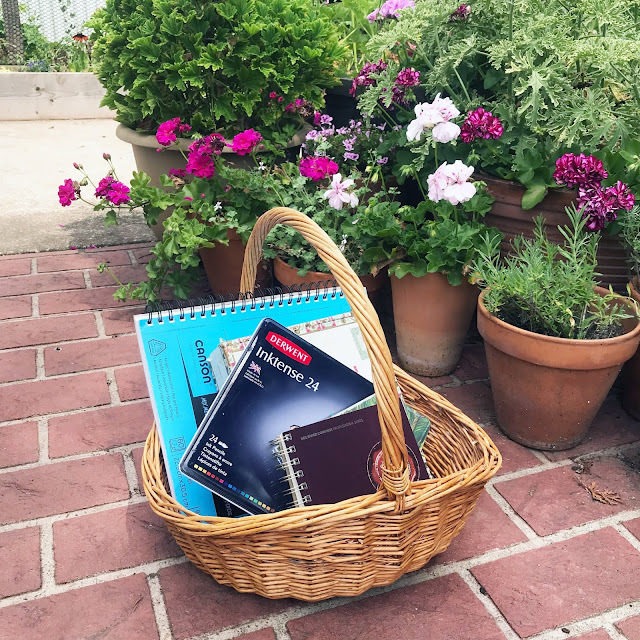 Have fun crocheting and let me know if you have any other questions! If not for the "no-reply" setting, I would have contacted you directly! Thank you, Mary! I hope you enjoy crocheting some roses! I have made a couple of them now and plan to make more. They are fun and beautiful. Thank you so much for sharing them.